Ageofcomp.info – How to remove? Ageofcomp.info, also known as Ageofcomp.info/search/start.html, is classified as a browser hijacker for its ability to alter your browser settings without your permission. It uses the bundling method in order to spread online, which means that it attaches itself to third party software. The goal of the hijacker is to benefit its creators by employing the pay-per-click system. That is why it not only changes your settings, but also inserts advertising data into your browsers. 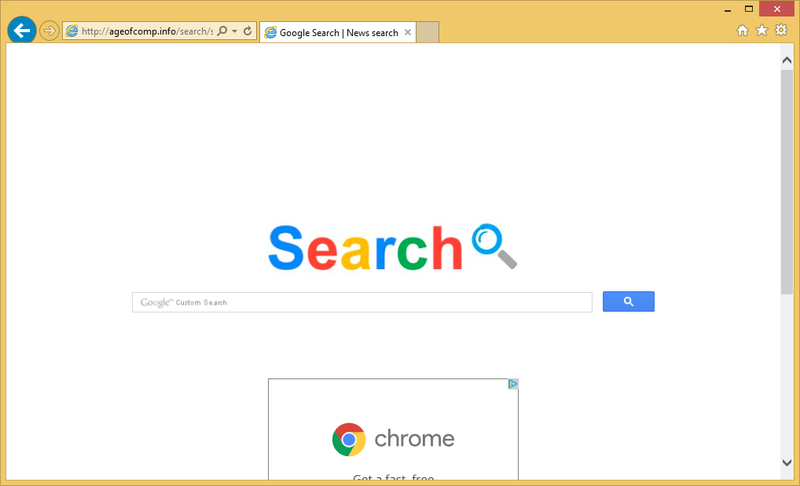 All popular browsers are affected by the hijacker, so switching to a different one will not make any difference. What you should do instead is terminate Ageofcomp.info completely. As we have mentioned above, the hijacker travels in freeware and shareware bundles. This distribution method is not exactly straightforward. Browser hijackers and other potentially unwanted apps are presented to users during the installation of free third party software. In most cases, users do not pay careful attention to it, and, therefore, they agree to adding unfamiliar applications to their PCs without even knowing about it. There is no question that you should be cautious when installing freeware: always choose the Advanced installation mode and decline all optional offers that you see in the wizard. The main symptom of the hijacker is the modified browser settings. Your home page and default search engine are replaced by Ageofcomp.info/search/start.html. The site itself does not look reliable as it contains fake ads. Moreover, if you use its search box, you will get results including sponsored links. In fact, you will encounter advertisements no matter where you go online. It is rather likely that some of them will be fake as well. The hijacker’s developers hold no responsibility for the content they expose you to, so you click on it at your own risk. We advise avoiding all adverts until you eliminate Ageofcomp.info from your browsers. You can choose from two Ageofcomp.info removal options. The first option is manual removal. It is not as full-proof as the second solution, however, you can complete it by following the instructions provided below the article. If, on the other hand, you want to not only erase Ageofcomp.info, but also ensure that your computer is clean from other threats, you should remove Ageofcomp.info automatically instead. You can implement the anti-malware from our page. It will scan your system and detect all unwanted components. It will then delete Ageofcomp.info along with other detected issues. Moreover, it will keep your PC shielded from various Internet-based infections as it comes with real-time online protection.